Did everybody get it wrong? 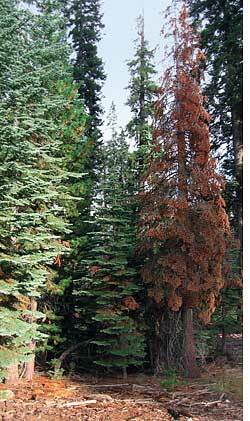 Trees--pines, firs, hemlocks--in western US died at twice the expected rate within the last few years. The rate of loss supersedes the rate at which the forests can regenerate. Massive tree deaths are making forests unsuitable for wildlife. The forests are in danger of turning into net sources of carbon dioxide to the atmosphere. An eleven-member team from the US evaluated several factors and zeroed in on regional warming as the most probable cause. The group investigated 76 plots of forests in western United States. The plots harboured nearly 59,000 living trees and the team studied data from two time periods: 1955 to 1994 and 1998 to 2007. They found that the average temperature in these areas had risen more than 1F over the last few decades. This created a drought-like situation for the trees. Higher temperatures also led to an increase in the population of disease-causing insects which in turn killed more trees. Since all the forests were older than 200 years, some even 500 years, they were more stable than young forests and competition for space was ruled out as the cause of tree deaths. "Regional warming has contributed to hydrological changes, such as declining rate of snowfall, thinning snow cover, earlier spring snowmelt and runoff, and a consequent lengthening of the summer drought," wrote the researchers in the January 23 issue of Science. This is the first large-scale analysis of mortality rates in temperate forests. In the Pacific Northwest and southern British Columbia, the rate of tree deaths in older coniferous forests doubled in 17 years. This rate of increase is about 1.5 times than the forests in California, where mortality rates took 25 years to double. California, however, had the highest number of tree deaths at the end of the study. Even small changes in mortality rates have devastating effects. For example, doubling the mortality rate from one per cent a year to two per cent a year means that instead of 60 per cent of the trees surviving after five decades, only 36 per cent would. The study found that mortality was the lowest for forests in the interior states and the rate of change was slower, taking 29 years to double. "Continued warming also increases the risk of forest fires. We should develop land-use policies," said Thomas T Veblen of University of Colorado, who was part of the study.